How to pack a pine tree in a Modo, earn free driving and transport eight people in one van. Pick up a tree "car-free"
"Our tree pick-up day arrived, filled with 'liquid sunshine', but that didn't dampen the kids' enthusiasm. Pile onto our big cargo bike? Ho hum, we do that nearly every day. But driving somewhere in a big red Modo van? Woohoo!" 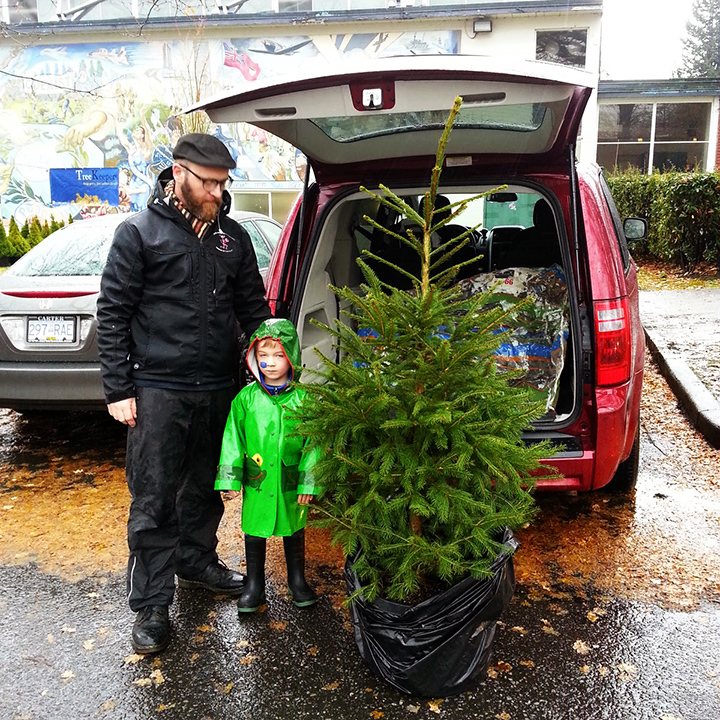 Before you pick up that Christmas tree this weekend, see how a (nearly) car-free family does it. 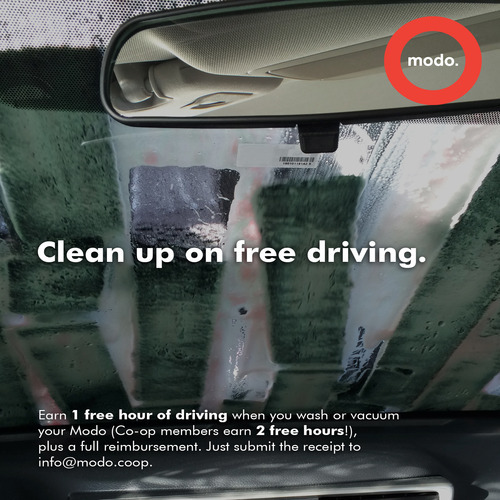 Shout out to Lisa and family for giving their Modo a quick vacuum after – those pine needles are the worst! New 8-passenger van at Kingsgate Mall! 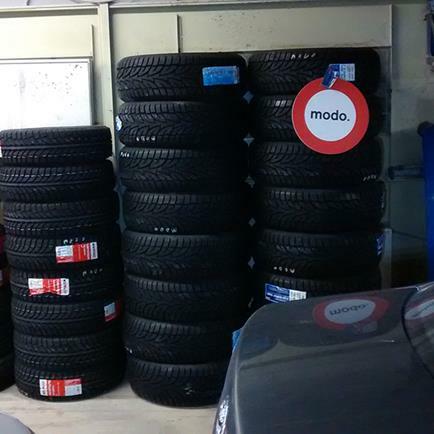 This winter, 43 Modo vehicles will be equipped with winter tires. All other vehicles are equipped with all-season tires – which may not be enough for a wintry trip to Kamloops or even getting around New West on a snow day. 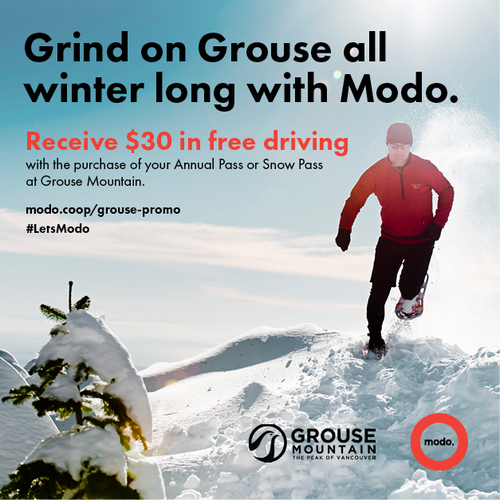 Modo's fleet director, Doug, shares why winter tires are your safest option and tips on how to book these vehicles. Member-owners will vote on whether to merge with Victoria Car Share (simultaneously as Victoria members vote at their own AGM). Board of Director election results will be announced. Interested in running? The deadline is today at 5pm! Pre-AGM, Modo staff and management will be on hand to show off what we've been working on (including a preview of our new app!) and to welcome your feedback. Post-AGM, enjoy food, booze, DJ, photobooth, prizes and a chance to meet the extended Modo family at the after-party! >> BC BUSINESS profiled our CEO, Nathalie in a recent Lunch with Lucy column – check it out! >> OVERNIGHT Casual members can drive all night for only $24! Perfect for running errands or a late-night date night. >> BUS CO-OP We're proud to support the newly launched Langley Bus Co-op! Read all about it. >> GIFT CERTIFICATES Our gift certificates make the perfect stocking stuffer! >> EARN 1 FREE HOUR when you book a Modo for the party, take a #selfie in front of the LOCO banner, and share it on social media with the tag #LetsModo! There's now a 2009 blue Nissan Cube (#238) instead of a Toyota Yaris. You'll find a 2014 blue Nissan Sentra (#587) instead of a 2010 Versa. We've swapped in a 2011 red Nissan Versa hatch (#344) for the Dodge Grand Caravan. Find a 2014 white Toyota Prius V (#563) in front of Place Vanier residences, at the corner of Agricultural Road. Our stall is directly on Lower Mall, just south of the Place Vanier main gates. There's now a 2014 yellow Toyota Prius C (#517) instead of a 2009 Matrix. We've placed a 2013 white Nissan Sentra (#508) instead of a Fiat 500. We're adding a 2015 grey Nissan Rogue (#583) and a 2014 yellow Toyota Prius C (#585) until their permanent home is ready nearby. There's now a 2014 silver Nissan Sentra (#589) instead of a 2010 Sentra. You'll find a 2013 white Nissan Versa (#435) at the CCEC Credit Union (2248 Commercial Drive) in the underground parkade. Enter from East 7th and our stalls are at the end of the ramp. You can find a 2014 grey Fiat 500 (#572) in the 300 block of Templeton Drive, between East Hastings and Franklin. There's now a 2014 white Nissan Versa Note (#588) instead of a 2011 Versa hatch. Find a 2015 white Nissan Rogue (#590) instead of a 2013 Sentra. 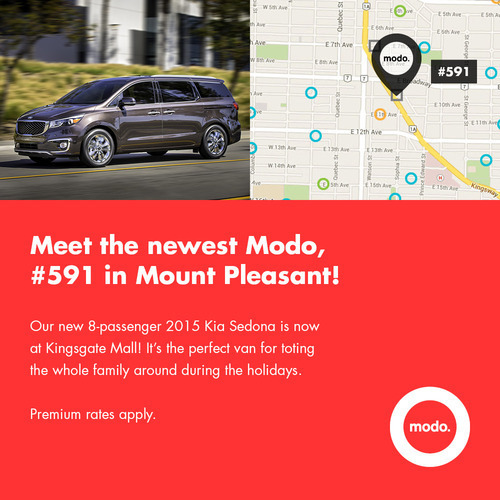 Our first premium 8-passenger minivan, a 2015 grey Kia Sedona (#591), joins the pickup truck at Kingsgate Mall. There's now a 2009 grey Toyota Yaris hatch (#250) instead of a Honda Civic. There's now a 2009 grey Toyota Matrix (#266) instead of a Dodge Grand Caravan.